Non-Spanish speakers may have a little trouble getting their tongue around El Gueguense's name, but no cigar lover will have any problem putting their lips on this mega-flavorful Nicaraguan puro. 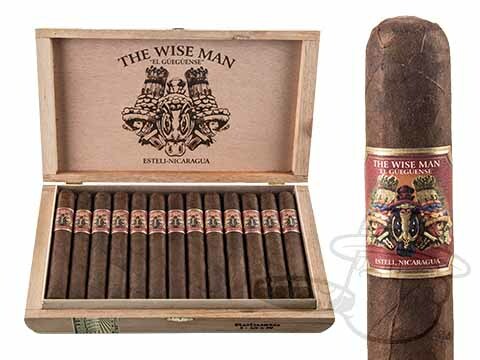 El Gueguense("el wah-when-say") translates from Spanish to "the wise man," and comes dressed to the hilt in a gorgeous and oily Corojo '99 wrapper leaf. More Corojo '99 serves as binder, hugging an elegant blend of cedar-aged Nicaraguan Corojo and Criollo long-fillers from 2011 and 2012. The resulting smoke is rich, smooth, and full-bodied, unveiling a diverse array of tasting notes as you burn. Tones of cedar, spice, and sweetness give way to subtleties of cherry, cocoa, and caramel in this enchanting cigar from the up-and-coming Foundation Cigar Company.